Have you ever seen a cuter bag? 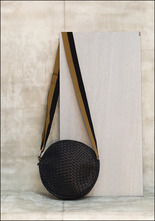 We love the circular shape and sporty vibe of this piece, which is also super lightweight and comfortable to wear over the shoulder or as a crossbody. Perfect for all the essentials. > Bag circumference: 8". Width: 3".